Preheat oven to 350 degrees. Spray a pizza pan with cooking spray. Press cookie dough into a circle on the pan. Bake for 10-12 minutes. Let cool. In a large bowl, beat cream cheese until fluffy and then add marshmallow creme and in mix in. Spread over cooled crust. Place in the refrigerator to chill while you prepare the fruit. Begin with arranging sliced strawberries in a circle around the outside edge. Next, working inward, make a circle with blueberries. Next, make a circle with the sliced kiwi, then strawberries, then pile some blueberries in the middle. In a small pan add sugar, cornstarch, orange juice, lemon juice, water, and salt. Bring mixture to a boil, and cook for 1-2 minutes, until thickened. Remove from heat and add orange zest. Allow mixture to cool, but not to completely set up. Spoon over the fruit on the pizza or use a pastry brush to brush the glaze over the fruit. Chill for at least a half hour or until serving. Cut into slices and serve. Try a few of these fruity faves to make your day brighter. I love myself some hot cheesy pizza. But one of my favorite pizzas actually doesn’t have any cheese or pepperoni on it. This Fruit Pizza takes a sweet twist on traditional pizza that thrills a girl like me with a sweet tooth the size of Texas. 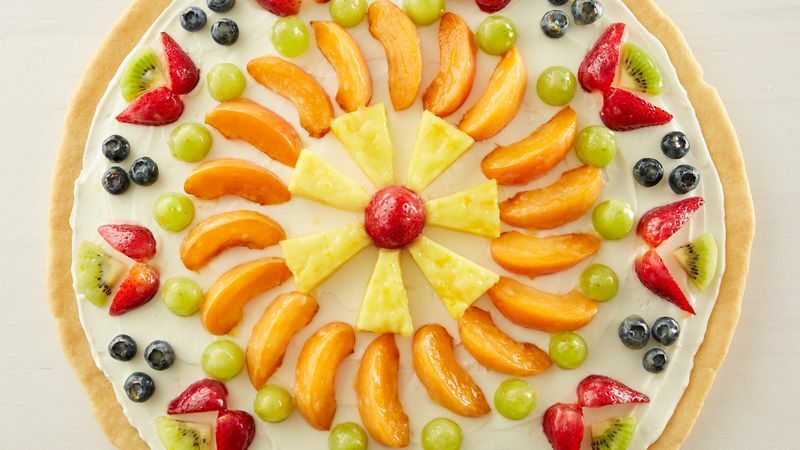 This light and summery dessert pizza is topped with fresh fruit and a sweet citrus glaze. Most fruit pizzas use a cream cheese and whipped topping mixture as a base, but on this fruit pizza, cream cheese and marshmallow fluff are combined and lathered all over. The sweetness of the marshmallow balances the savory cream cheese and gives the pizza a unique texture. After spreading the marshmallow/cream cheese mixture onto a baked sugar-cookie crust, you’re left with a blank canvas to get your creativity juices flowing. It doesn’t matter how you arrange your fruit, the bright colors on the creamy frosting will be beautiful in any pattern. I used strawberries, kiwis, and blueberries here, but you could use any of your favorite fruits. Although I do like to stick to firmer fruits since they hold up longer. A sweet citrus glaze can be made in just a couple of minutes to brush on your fruit. The glaze sets this pizza apart from other fruit pizzas and gives it a gourmet look that you would usually see at a bakery. Dig in!